the colored boy: Wrote a thing for Saint Heron: "Black In The Day: Back To School Edition"
Wrote a thing for Saint Heron: "Black In The Day: Back To School Edition"
In my latest installment of "Black In The Day" for Saint Heron, I reflected on some of the most memorable on-screen moments from Black academia's past. As chirren, teachers, staff, parents, and administrators greet new year of adventure down at the schoolhouse, let’s take a look back pon some of the phattest and most memorable moments from Black academia’s past. When report cards and parent-teacher conferences roll around, you might might need some positivity to help keep hope alive. 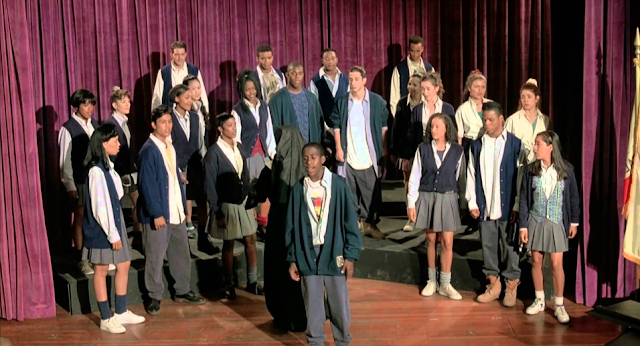 Let’s start the moonwalk down Memory Lane with Spike Lee’s famous ode to collegiate colorism and intraracial hair hateration in Mission College’s dancerie, “Good and Bad Hair” from 1988’s School Daze. Though the film addresses apartheid, class issues, and misogyny with the help of a stellar cast of hella talented Chocolatey Wonders, it is the spite-filled salon showdown betwixt #teamlightskin and #teamcholocolatey that keeps me coming back to this movie because I love a grand dance scene. Long before she learned how to go to work on Myra’s feet, Tisha Campbell (Jane), She Who Would Become Whitley Gilbert, and the mostly fair-skinned Gamma Rays (the “Wannabe’s”) with “good hair” danced it out against the mahogany, natural haired so-called “Jigaboos,” trading brutal jabs and sickening 8-counts, proving that all skinfolk ain’t your kinfolk. That choreo is popping, though. Shoutout to Otis Sallid. Read the rest over at Saint Heron. Subscribe to The Colored Boy Report, Alexander Hardy's personal newsletter, and receive updates and exclusive content via email. Aaaand I have a podcast. Subscribe to The Colored Boy Report and receive updates and exclusive content via email. read about me, your host, here. stalk me. but not too much, okay? How to Be Blackety Black in Panama, Part One.